The Belize Amateur Golf Association hosted its Mexicana Masters Tournament in Cozumel, Mexico. It was a great weekend with lots of golf and fun for all the players and families. 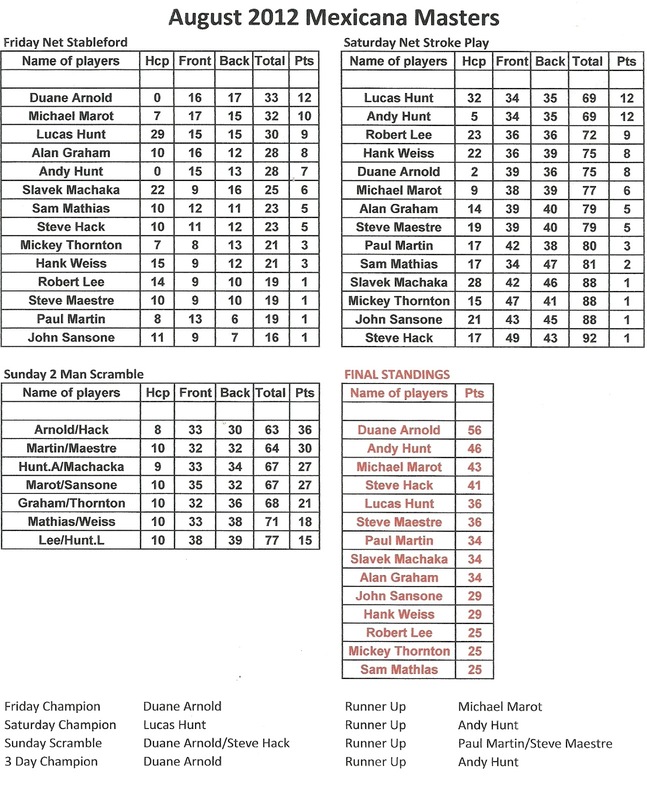 Fridays Stableford : 1st - Duane Arnold, 2nd - Lucas Hunt, 3rd - Michael Marot. Saturdays Stroke Play : 1st – Lucas Hunt, 2nd – Andy Hunt, 3rd – Robert Lee. 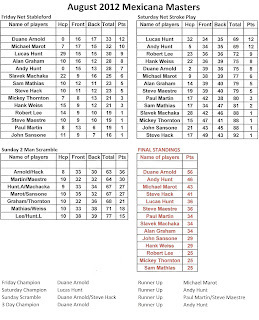 Sundays Scramble : 1st – Duane Arnold/Steve Hack, 2nd – Paul Martin/Steve Maestre. 3 Day Champion – 1st, Duane Arnold, 2nd – Andy Hunt, 3rd – Michael Marot. Highest Score on a hole – Slavek Machacka (12), Mickey Thornton(10). 3 Day Tournament Donkey – Sam Mathias. It was a big success and BAGA look forward to our next tournament at Roaring River Golf Course on Sept 15th. ALL WELCOME. BAGA, This whole event was too good! It was a really fun and good time for everyone! Many thanks to BAGA, the Cozumel Country Club, all the individual members of the BAGA that participated, their Wives, Girl Friends and Children! I can hardly wait until our next big adventure! I am also waiting with baited breath to see the videos that are going to go viral! For the BAGA members that were unable to make this trip, we missed you and yours. You guys and your families truly missed out on a great time.